IOT stands for Internet of Things and refers to small devices equipped with direct internet connectivity, without needing an external computer. They are usually composed of a main microcontroller and an additional connectivity (eg. ESP8266 for Wifi, ENC28J60 for Ethernet) or they are complete SOC including both the processing unit and the connectivity modems in one single package. Regardless of their form or shape, these devices open new applications for remote sensing and controlling, and bring system automation to a new level of performance. Examples of such devices were presented on this blog even before IOT was coined as a buzzword. See the Ethernet controlled power relay based on enc28j60 or the development of first prototypes of what is now uRADMonitor. 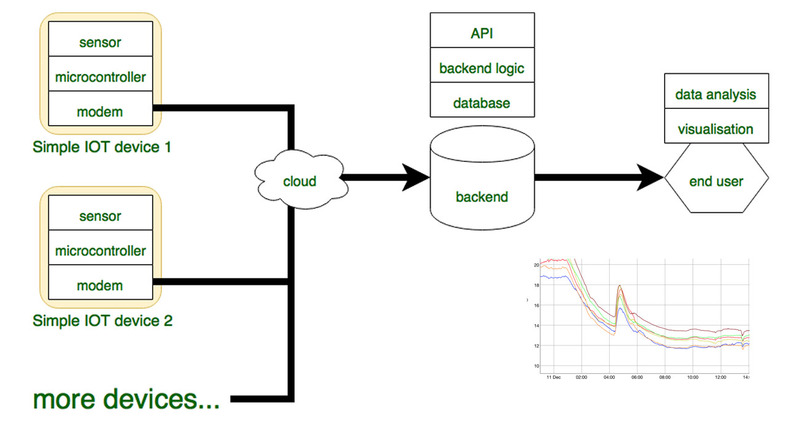 For the backend I will demo using the open source EXP server protocol introduced with the KIT1. This is handled by the uRADMonitor server, but alternatively a simple PHP script can be used too. With the simple IOT device ready, we need to program it. The firmware needs to setup the Wifi connection to an Internet Wireless Router, then periodically read the temperature values and send them to the backend. CH340G driver also available here. Under Tools -> Port, select the corresponding serial port as allocated to the CH340G connected to your USB port. Go to Tools->Upload speed, and select 921600. DallasTemperature sensor(&oneWire); // Pass our oneWire reference to Dallas Temperature. Now we need to add ESP8266 code logic, to make the module connect to an Internet Wireless Router at program start, then periodically read temperature and send it to the backend. The EXP protocol was introduced with the open source KIT1 design, to implement a way of building custom IOT devices with a variable number of sensors. It defines the communication rules between an IOT Device (“Device”) and a backend server (“Server”) for the purpose of exchanging Sensor Data (“Data”). Each Device is uniquely identified using a Device ID allocated by the Server. All devices must have an Owner, identified with a UserId / UserKey pair. The EXP Protocol is a bidirectional communication protocol – for the very minimum, the Server needs to return a unique allocated Device ID, the very first time a device connects (or in case the device reports an invalid Device ID). Most of the traffic however is for uploading data from the IOT Device to the Server. The Device ID is an 8 digit HEX number in the form 13XXXXXX. 13 is the Device class and is immutable, while the following digits are the Device number and are unique from one unit to another. The Device ID is saved in the EEPROM at address 0, using 4 bytes. 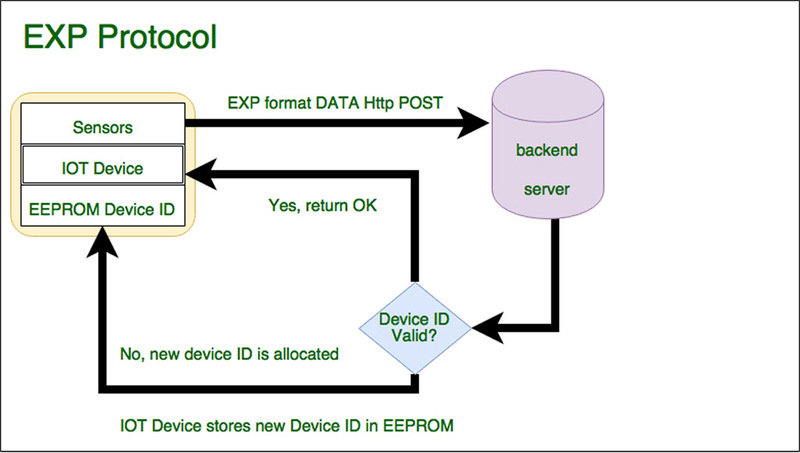 On startup, the Device reads its own Device ID from the EEPROM. The very first time, the Device number will be 0 (invalid) but the Device class will be added (13000000). Every minute, the temperature sensor is read, and a HTTP Post is issued to the Server. If the Server receives an invalid Device ID (like 13000000), it will allocate a new valid Device ID and will return it as a response to the HTTP Post in JSON Format. The IOT Device will parse the response, and if a Device ID is received, it will store it to the EEPROM so on the next call will report with a valid Device ID. Each Device belongs to an Owner, identified with a User Id / User Key pair. You will need to register a user account on the uRADMonitor Dashboard. The User Id / User Key pair needs to be sent out with each HTTP Post call. Reporting the time with “01” is compulsory. This simple construction illustrates the IOT concept and provides a solid base for expanding to more complicated sensors. The EXP Protocol can be used to add additional readings to the “Simple IOT Device”, including sensors for CO2 or PM2.5. NO-SLEEP: The No-Sleep setting will keep everything on at all times. This will drain the most current. MODEM-SLEEP: Modem-sleep is the default mode for the ESP8266. It’s only enabled when you’re connected to an access point. In this mode, the ESP8266 will disable the modem (WiFi) as much as possible. It turns off the modem between DTIM Beacon intervals. This interval is set by your router. LIGHT-SLEEP: Light-sleep performs the same function as Modem-sleep, but also turns off the system clock and suspends the CPU. The CPU isn’t off; it’s just idling. DEEP-SLEEP: Everything is off but the Real Time Clock (RTC), which is how the computer keeps time. Since everything is off, this is the most power efficient option. 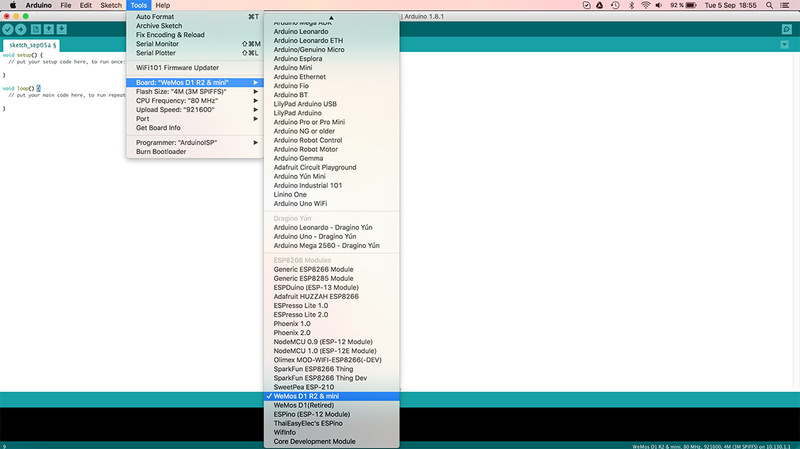 Simple IOT code REPO, you will need to configure your wifi settings in the code, the AP_SSID and AP_KEY . Code mirror here. The participants received tens of kits to assemble (including some soldering) their “Simple IOT” devices, a cube like unit that runs on battery, measures temperature and sends all data online via Wifi. The workshop went great, and at the end we got several units up and running, talking to the server to report remote temperature readings. More on this on the uRADMonitor blog.